Featured: Videos recommended by YouTube’s own staffers. Most Viewed: What the YouTube community is watching. After tapping Most Viewed, tap All to see the most watched YouTube videos of all time. Tap Today or This Week to check out the videos most currently in vogue. 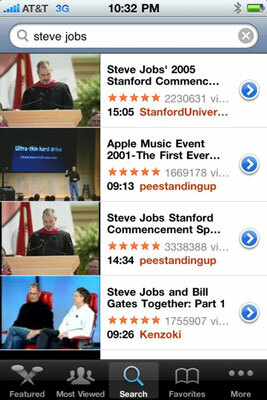 Favorites: After stumbling on a video you like, add it to your Favorites by tapping the Favorites control. You can log into your YouTube account with your username and password to save and sync these favorites. Most Recent: Newly submitted videos. Top Rated: The people’s choice. YouTube’s audience chooses the best. History: Videos you recently viewed. My Videos: The place for videos you star in. Subscriptions: YouTube channels you subscribe to. Playlists: Videos categorized into playlists. Drag your preferred icon over the one you want to relegate to the YouTube bench. You can also rearrange the icons by dragging them left or right. 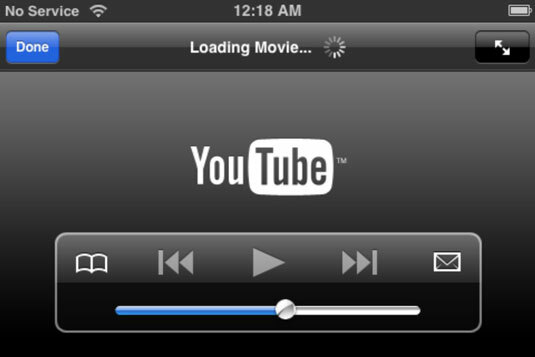 While the movie you’ve selected is downloading — and how fast it arrives depends on your network coverage from AT&T or Wi-Fi — you see a black-and-gray screen with video controls and the YouTube logo. The controls disappear when the movie starts playing.